On Friday 26 October, the UK Minister of State for the Ministry of Justice, Rory Stewart, gave a lecture on “The International Response to Fragile/Conflict States” for the International Development Department’s Cutting Edge Issues in Development lecture series. Two International Development students wrote about the lecture for us. 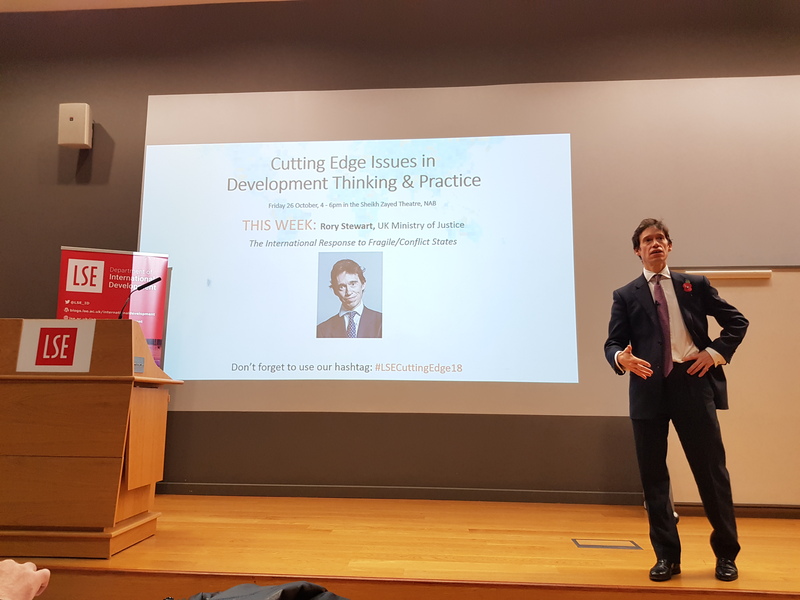 In Afghanistan “we were facing a disaster situation: poverty, disease, lack of education, violence, and human rights violations, especially against women”, said Rory Stewart during his lecture for the Cutting Edge Issues in Development Thinking & Practice series. However, this problem statement was not followed by a proposed solution or a success story. In a much more realistic tone, Mr Stewart talked about his experience working and walking across Afghanistan, which he later on captured in one of his most acclaimed books, The Places in Between. Two key takeaways stand out from this conversation. First, Mr. Stewart is skeptical (to say the least) about the efficiency of international aid in fragile/conflict states, spending literally trillions of dollars just in Afghanistan. Not because it is not useful or necessary, but because of its trend to impose generic solutions in complex contexts that are anything but generic. The international community uses highly technical documents and periodic briefings that state what the region lacks, but disregards any local, bottom-up knowledge and expertise to actually reach the goals initially set. This has to change if sustainable, long-term development is to be achieved. Second, one of his main lessons learned is the need to keep track of failures. As development practitioners, we need to learn to speak truth to power, even if it is difficult to acknowledge we don’t know what we’re doing. This also implies to embrace the hard truth that many of the problems we face may not have a solution. The idea that failure is not an option is dangerous and misleading – in fact, failure is often inevitable. But, does that mean we should just give up peace-building projects around our conflicted world? Mr Stewart’s answer is: absolutely not, but the approach has to be very different. Solutions must be designed and implemented alongside the local people. Experience has taught him that working side by side with Afghans to reconstruct Kabul’s destroyed buildings is far more fulfilling than sitting in an office within a bunker, managing an enormous budget. “[As development practitioners], we must be humble, and know who we are, what we don’t know, and what we are unfit to do, before we make any attempt to improve these people’s lives”, Mr Stewart said. Pedro Ponce is an MSc Development Management student. From a municipal government, he has worked in police reform and civic justice in Mexico, alongside USAID and the British Embassy. He is interested in how democratic law enforcement capacities at the local level can foster state- and peace-building in developing countries. When Rory Stewart began his lecture on fragile states, conflict and state-building by saying that he disagreed with lectures that set out accessible take-aways, because he does not think you can hear ideas on state-building and then be able to take them off and apply them in Somalia or South Sudan, I was not quite sure what to expect. His illuminating talk, however, brought some new dimensions to a topic many have studied from an academic or theoretical perspective. Stewart used Afghanistan, a country in which he has worked and travelled widely, as a lens for framing some of the problems of the classical approach to state-building. He provided some interesting insights into the competing influences at play when the Afghan National Development Strategy was designed back in spring 2002. He highlighted the role of the diverse components of the international community, as well as their approach to framing the problem, and labelling Afghanistan as a failed state, and the preconceived set of assumptions and solutions this brought to the table. Stewart stressed the importance of a deep social science understanding of the context of the country, as well as the ethnic and social diversity as a prerequisite for the international intervention in a fragile or post conflict state. He noted that the international community’s approaches to state-building and post conflict reconstruction had to be about more than project management strategies. When asked if he thought foreign intervention still had a role in post conflict reconstruction, he noted that it was important to study successful examples of foreign intervention, as we can learn as much from this as from our failures. It was interesting to hear Stewart draw parallels between his current work as Minister of State in the Ministry of Justice with a responsibility for the UK prison system, and his approach to his work for the Department of International Development, in ways that would not immediately seem obvious. While bringing more questions than answers, Stewart’s reframing of the problems associated with post conflict reconstruction left us all with lots to reflect on over the course of the academic year. Malika Giles is a student on the International Development and Humanitarian Emergencies programme, and previously worked in Tajikistan and Afghanistan. She is interested in community preparedness and state response to natural disasters, as well civil society in post conflict states.